You are going to love this easy Sweet Potato Fritters recipe!! When I was asked to come up with a recipe using Australian Sweet Potatoes (an ingredient which is usually found in our kitchen anyway!) it gave me the perfect excuse to experiment with a recipe I had been thinking about for a little while now – Sweet Potato Fritters! 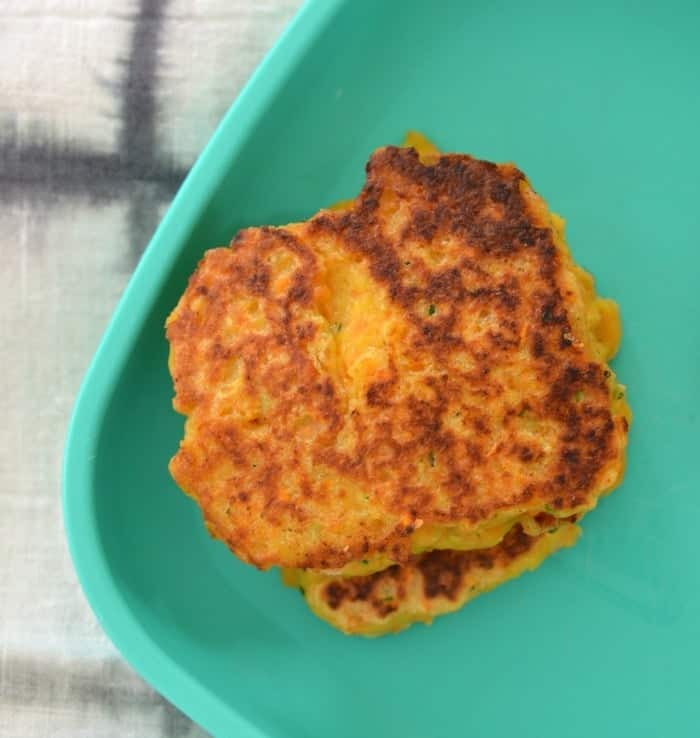 This Sweet Potato Fritters recipe is based on my Cauliflower and Cheese Fritters (which my entire family just loves!) and I was pretty confident they would also love my sweet potato version. 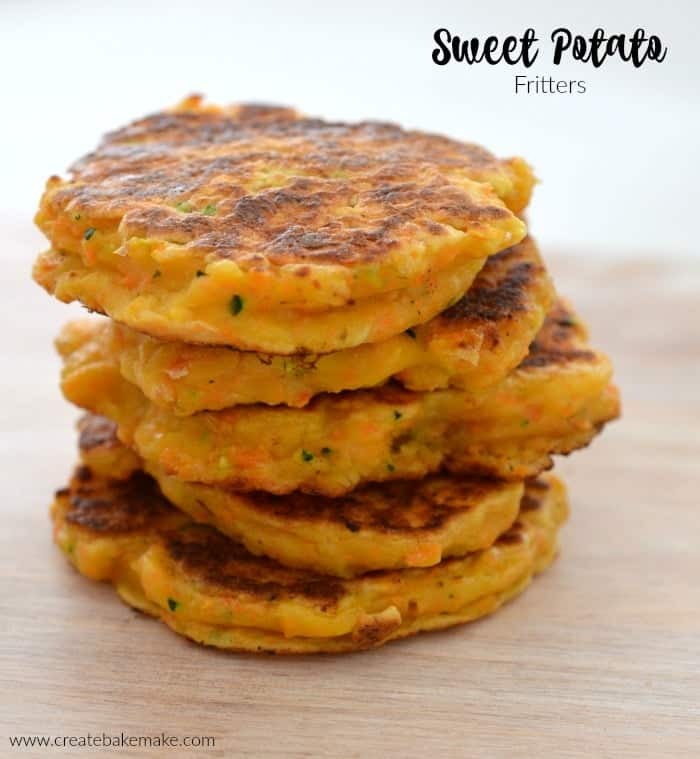 As Sweet Potatoes are a great source of dietary fibre, niacin, folate, magnesium and calcium and have a low GI (which means they help you feel fuller for longer) these tasty Sweet Potato Fritters the perfect filling meal or snack (and lunchbox filler!) for the entire family to enjoy any time of the day. We simply serve them with some extra vegetables, salad or even roast chicken/lamb to help turn them into a yummy lunch or dinner and my kids also like to eat them warm with some tomato sauce for their breakfast. They are also great for the little hands and I’ve popped these into my boys lunchboxes and they have gobbled them up – yay! As this recipe makes A LOT of fritters, so why not store some in the freezer for another time. Simply store them in a freezer safe container (or even ziplock bags) for up to two months and then reheat in your oven on 180 degrees for approximately 10 – 15 minutes. 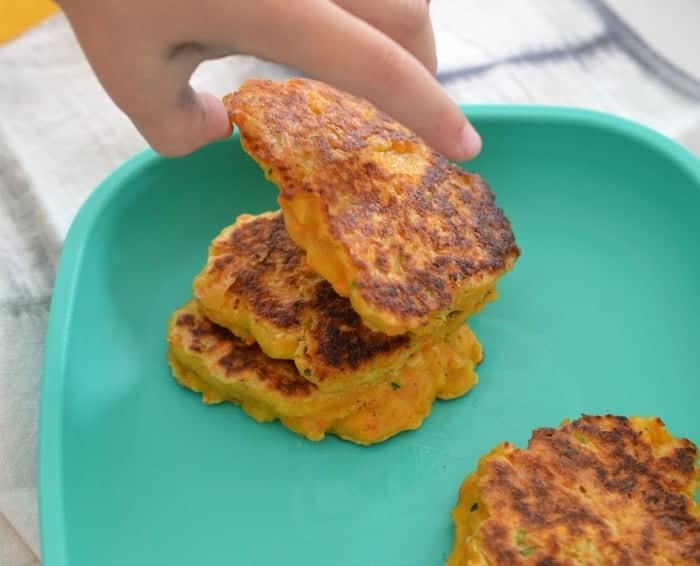 These easy Sweet Potato Fritters are a versatile snack or easy meal. They are freezer friendly and can also be made using a Thermomix. Grate the peeled sweet potato and place into a large bowl. Add the crushed garlic, onion flakes, grated zucchini, tasty cheese, parmesan cheese to the bowl with the grated sweet potato and add the self raising flour before stirring well to combine. Beat the eggs in a small bowl lightly with a fork and add salt and pepper to taste. Add the eggs along with 1/4 cup of water to the bowl with the sweet potato mixture and stir. Gradually add the extra water and stir until you have a thick batter - please note you may not need all of the water depending on the size/water content of the sweet potato and zucchini that you used. Cook the Sweet Potato Fritters for 5 minutes on each side until they are crisp and golden brown before transferring to a plate and covering them with foil so they stay warm while you cook the next batch. Repeat until all the fritters have been cooked. 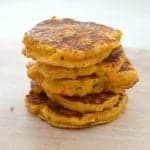 These Sweet Potato Fritters are freezer friendly. Without washing the bowl, add the Zucchini (which has been cut into 3cm pieces) into your thermomix bowl and mix for 4 seconds on speed 6. If you would like it cut into smaller pieces, mix for a further 2 seconds. Transfer to the bowl with the grated cheese. Without washing the bowl, add the sweet potato (which has been cut into 4 cm pieces), garlic cloves and onion flakes to your Thermomix bowl and mix for 6 seconds on speed 8 to grate the sweet potato. If there are still large pieces in your Thermomix bowl, scrape the sides and blitz for a further 3 seconds on speed 6. Add the grated cheeses and zucchini, along with 2 eggs, 300g of self raising flour, and 1/4 a cup of water to your Thermomix bowl in that order – please note you may not need all of the water depending on the size/water content of the sweet potato and zucchini that you used. Mix for 15 seconds on speed 4 REVERSE to combine the ingredients. Scrape down the sides of the bowl and if your mixture is still a little dry, add the remaining 1/4 cup of water and mix for a further 15 seconds on speed 4 REVERSE or until combined. Cook the Sweet Potato Fritters for 5 minutes on each side until they are crisp and golden brown before transferring to a plate and covering them with foil so they stay warm while you cook the next batch. Repeat until all of the fritters have been cooked.